Thanks to Zach Baldwin for this photograph! 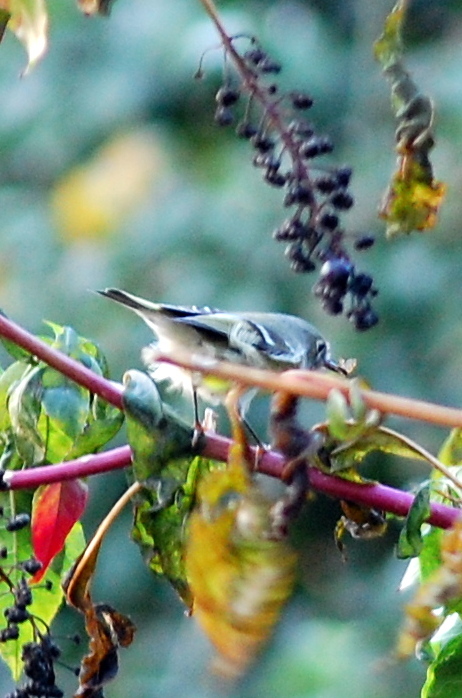 My resident birder tells me it’s most likely a ruby crowned kinglet, and I can tell from the bright pink stems and the clusters of berries that the bird is sitting on a pokeweed stem. Ruby crowned kinglets are acrobatic feeders, climbing around plants, hanging upside down and even hovering to glean small insects from the foliage. They love insect and spider eggs that are often attached to the undersides of leaves. In winter, they’ll occasionally feed on berries. The more I look for the hot-pink stems of pokeweed, the more I notice them. There seems to be at least one in every parking lot I’ve been to lately. The berries are an important wildlife food, but I’d never thought of the leaves as being critical for birds. The floppy leaves are a surface—a placemat, if you will—for birds to dine upon.